The coat of the English Coonhound is short and hard. Coat colors include: blue and white ticked, red and white ticked, tricolored with ticking, red and white, and white and black. Excessive red or black is a fault in the show ring. Its bark sounds like a hound’s bawl. The tail is medium length and set high. Pleasant, alert, confident and sociable with humans and dogs. English Coonhounds are energetic, intelligent and active. Loving and eager to please their owners, their great senses make them excellent hunters. This breed is an extremely fast, hot-trailing competitive type coonhound. Very devoted to its family, it makes a good companion dog. It does well living indoors and plays a fine guardian to his family and home. They are usually best with older considerate children, but can also do well with younger ones. Without proper human to canine leadership and communication some can be a bit dog-aggressive and/or develop behavior issues. They need owners who are firm, confident and consistent with an air of authority. Socialize this breed well, preferably while still young to prevent them from being reserved with strangers. Do not let this breed off the leash in an unsafe area, as they may take off after an interesting scent. They have a strong instinct to tree animals. Without enough mental and physical exercise they will become high-strung. These dogs are not recommended for apartment life. They are very active indoors and do best with acreage. English Coonhounds need extensive daily running to be happy. They need to be taken on a daily, long, brisk walk or jog where the dog is made to heel beside or behind the human holding the lead, as in a dog's mind, the leader leads the way. They can become high strung and/or destructive if they are lacking in exercise and/or structure. They may take off after any interesting scent, so do not take the English Coonhound off its leash unless you are in a safe area. The short, hard coat is easy to care for. Comb and brush with a firm bristle brush, and shampoo only when necessary. This breed is an average shedder. It has been said that the history of the English Coonhound is the history of all coonhounds. 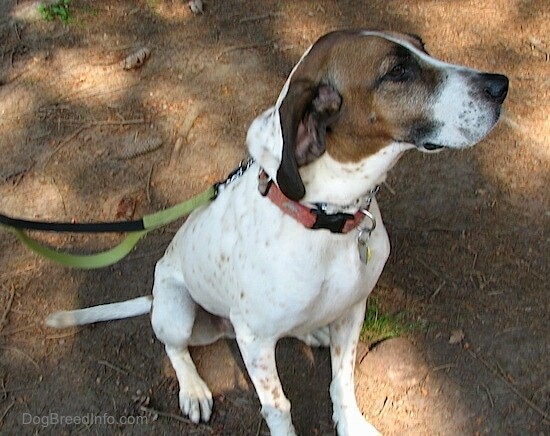 With the exception of the Plott Hound, most coonhounds can be traced back to the English Foxhound. In 1905 the English Coonhound was first registered by UKC under the name of English Fox & Coonhound. Back then they were used for fox hunting much more than they are today. 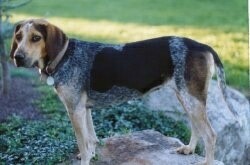 The name reflected the similarity that the breed had to the American Foxhound and the English foxhound. While the Redbone and Black and Tan were given separate breed status, all other treeing coonhounds were called English after the turn of the century. These included both the Treeing Walker Coonhound and the Bluetick Coonhound. They were considered all the same breed. It was the variation in color which separated them. 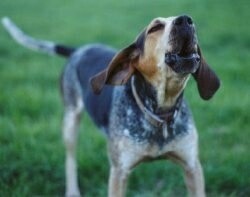 The heavily ticked dogs split off from the English, and the Bluetick Coonhound was recognized as a separate breed in 1945. 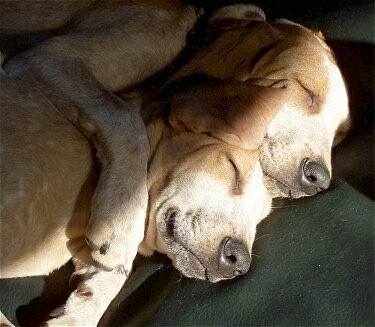 In 1946 the tricolored hounds separated into the breed called Treeing Walker Coonhounds. Though red-ticked dogs predominate, to this day there are still tricolored and blue-ticked English hounds. 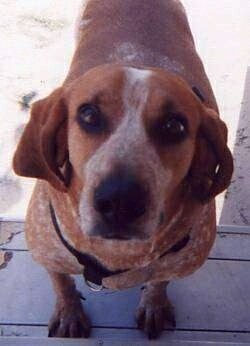 The English Coonhound was bred to adapt to the rougher American climate and terrain. An English named "Bones," owned by Colonel Leon Robinson, won one of the first National Coonhound Championships. The breed is still used by practical hunters and competitive hound owners throughout the USA. 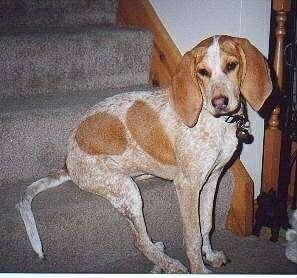 Three-year-old Flora the Redtick Coonhound sitting on the steps. 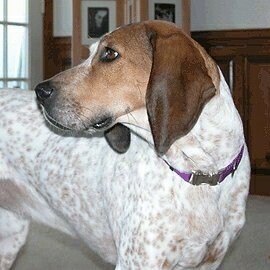 Lydia at 1 year old—she is a blue-ticked color phase of the English Coonhound. Cody the Redtick Coonhound (English Coonhound) at about 1 year old—his owner says, "He loves to lounge and sleep on the couch and on the bed with you. As you can see in this picture he seems to think that he's a cat (that's what we think at least) he likes to lie on the back of our couch and watch out the window. We're not sure how he will do hunting, but we will find out this year." Dixie the one-year-old English Coonhound—her owner says, "She is the sweetest, most people-loving dog I have ever owned." Purdie at 2 ½ years old has tons of energy. This is Hannah at two years old. This was Hannah when she was a puppy with her kitty friend. 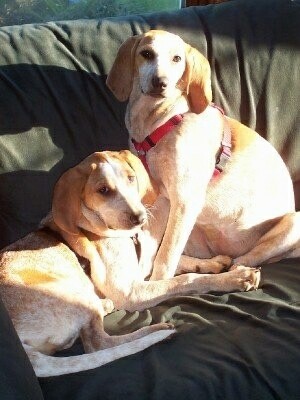 Lillie and Mollie, Redtick English Coonhounds at 6 months old—"I took these photos one morning when they were sunbathing on the couch. We've never had 2 more loving dogs. They are sisters and very affectionate and playful with each other."